If you wanted a football match to launch a Premier League season then this was it. It had everything, end to end football, some stunning goals, late comebacks – great for the neutral I’m sure but not great for Arsenal fans or Arsene Wenger with only 20 minutes to go! Arsenal had the perfect start with new signing Alexandre Lacazette scoring with 2 minutes of the game gone. Then Arsenal, did an Arsenal. Leicester scored twice to take the lead which in no part came from defensive naivety from a make-shift back three. With Mertesacker, Koscielny and Mustafi out injured or suspended, we played Rob Holding (to be fair has been excellent for us), Nacho Monreal and Sead Kolasinac. With the back three flanked by Hector Bellerin and Alex Oxlade-Chamberlain, at times we struggled and it will be interesting to see who our first choice back five is when everyone is fit. Rob Holding struggled and Arsene Wenger eluded to it in his post-match press conference, which I feel is a bit unfair as he didn’t have an experienced central defender helping him out. We conceded two goals from set-prices and another from a situation where Granit Xhaka gave the ball away, which on the night was quite a lot. Our midfield struggled and Leicester successfully stifled the influence of Xhaka and Elneny, with Mesut Özil trying his best but ultimately unable to exert his usual influence on the game. In attack Arsenal looked good, considering Leicester had 10 men behind the ball and credit to them, the opposition looked very good indeed and similar to the Leicester of two years ago. Vardy looked razor sharp and you forgot how quick he really is but he gave our back three all kinds of problems last night. Albrighton, perhaps a player who doesn’t get all the plaudits has one hell of a delivery and his cross lead to the first Leicester goal. Lacazette put in a decent shift but was pretty much up against 3/4 players all night, and was unlucky not score another when Giroud laid the ball off and he showed quick feet, only to be denied by a great save from Schmeichel. Danny Welbeck did well and scored after a nice lay off from Kolasinac and of course then there are the super-subs, Aaron Ramsey and Olivier Giroud. With 20 minutes to go, Arsene Wenger brought on Aaron Ramsey and Olivier Giroud for Rob Holding and Danny Welbeck. Arsenal then had a back four which included a winger and three full backs in Oxlade-Chamberlain, Nacho Monreal, Sead Kolasinac and Hector Bellerin. And to their credit, Arsenal went for it and it all paid off in the end. A Mesut Özil corner found its way to Granit Xhaka, who found Aaron Ramsey at the back post. His first touch was excellent and he smashed the ball into the net with a powerful toe-poke. Arsenal had Leicester on the ropes at this point and a lovely through ball from Ramsey found Giroud who played the ball back to Lacazette. The Frenchman weaved his way past 3 players before lashing a shot towards the roof of the next, before Schmeichel tipped it over the bar. From the resulting corner from Xhaka, Giroud scored a simply stunning header – only a goal he could score – which bounced off the underside of the bar and over the line. 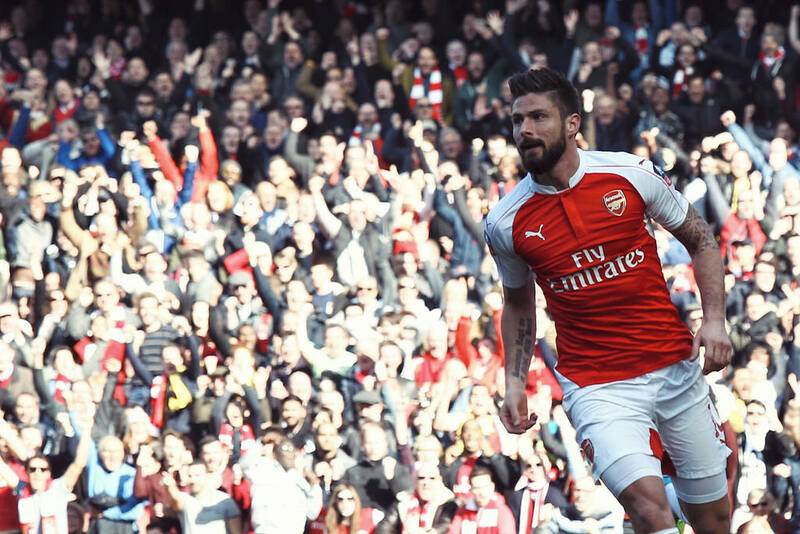 The comeback was complete and Olivier Giroud showed how vital he is to Arsenal’s season. Without him, we could have (and probably would have) dropped points and all the negativity around the club would have reared it’s ugly head. But as it stands, Arsenal are top of the league with an opening day win and have maximum points. We all know what it’s like in the Premier League these days and dropping any points at all is a massive setback if you aspire to win the title. Olivier Giroud gives Arsenal something no-one else can, and it’s vital that Arsene Wenger can find a place for him in our starting eleven. When he came on, his link up play with Alexandre Lacazette was excellent and that is something which could push us on to greater heights. Did well to deny Jamie Vardy on a couple of occasions – firstly after coming off his line quickly to stop a through ball and then a quick dive at the feet of the pacy striker when the game was carefully poised at 4-3. Probably could have done better on a couple of the goals Leicester did score, but had a make-shift defence in front of him. Had a night to forgot, poor lad. Gave everything and you cannot fault his effort but struggled against an experienced and cunning strikers in Vardy and Okazaki. Probably should have closed down Fuchs much quicker to deny the first Vardy goal and overall had a tough evening. You’re asking a player who isn’t a central defender to command the back line with a young Rob Holding and a new signing who is also more of a full back in Sead Kolasinac. Did as well as he could but was asked to play out of position – if he’s in the back three he’s usually the left sided defender alongside two central defenders. Played the ball out of the back well but struggled against the Leicester attacks and we were too open at the back. A bit of a strange debut – struggled defensively (which is a bit of a problem if you’re playing as a central defender) but strangely did really well going forward. Played incisive and positive passes forward, and was unselfish when through on goal and showed real composure to lay the ball off to Danny Welbeck for our first equaliser. Involved in most things and gave it everything – so overall a positive start for the Tank. Up and down the right flank all night and gave 110%. Gave Arsenal width which was needed to stretch the Leicester back line but did leave the poor Rob Holding exposed defensively at times which caused Arsenal big problems. Bright and incisive, Oxlade-Chamberlain always took on the Leicester defence and caused the visiting team problems – and was unlucky when he lashed a left-footed effort just over the bar in the first half. Very positive play from him and you wonder if left wing back will be his permanent position. Provided two assists on the night which proved decisive but was generally poor all night – giving the ball away on so many occasions and lost possession for Leicester’s second goal. Struggled to link up with Elneny with any meaningful influence but did better when Aaron Ramsey came on. Was out of his depth which was disappointing after a good performance against Chelsea last week. Wasn’t helped by Leicester sitting so deep so had no space to really help the team. Moved the ball on well but couldn’t seem to penetrate the Leicester midfield. Had a poor night for me. Didn’t look himself at all and seemed to me as if he wasn’t fully fit. Not and influential as we know he can be and his performance showed why there is no interest from any big clubs in signing him. Too peripheral and floats in and out of games far too often. At half time I wanted Arsene Wenger to bring him off and bring on Olivier Giroud. Tried time and time again to make something happen and was full of running for the cause. Didn’t have much space at all to do anything but scored the vital equaliser and had a few moments where he got through their defence and was unlucky not to score. Made a dream start with a goal after 2 minutes and showed some good touches. Tough to judge his performance as Leicester had a 10 man defence and could have been the hero at 3-3 when his fancy footwork in the box almost resulting in a goal. Overall a positive debut with a goal and win, and you can’t really ask for any more than that. Came on and was decisive, positive and lead the team forward. Excellent goal and excellent influence when he came on. Getting a reputation for being a super-sub, but he really is super. Gave Leicester City all kinds of problems and scored a simply stunning header which only he can. Football is all about fine margins and I dare say without him in our squad, we would struggle badly this season. Made no meaningful contribution and not sure if he even touched the ball? This entry was posted in Match Reports, NewsNow by Mike | afc4life.co.uk. Bookmark the permalink.